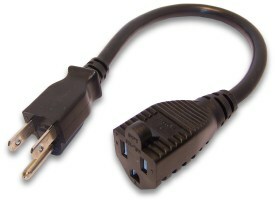 These short power extension cords are often used to connect bulky wall power supplies ('wall warts') to power strip outlets. Power supplies often take up the space of two or three outlets on a power strip. Using this short extension cord allows the power supply to be a short distance from the power strip and free up the adjacent outlets for other devices. These are sometimes referred to as "Outlet Savers" (typically the 1 foot power extension cords) and are similar to the Power Strip Liberator® products. We also offer other lengths that come in handy when a cord needs to be extended just a few feet. The cords use 16AWG wire.